Noah Hanifin, who was given an A rating on NHL Central Scouting's preliminary players to watch list, is a freshman at Boston College in Hockey East. The 6-foot-3, 203-pound defenseman had eight goals and 33 points in 45 games for the United States National Team Development Program Under-18 team in 2013-14. 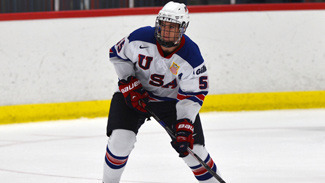 Hanifin, considered by many to be the best defenseman available at the 2015 NHL Draft, had one goal and five points for the United States at the IIHF 2014 World U-18 Championship. The native of Norwood, Mass., has offered to maintain a blog for NHL.com leading up to the 2015 NHL Draft in Sunrise, Fla. The season has started off well. As a team, we are becoming much closer as a group and starting to gel in practice. We suffered a tough loss against UMass-Lowell (5-2 on Oct. 10), but used it as a motivation. From that game we learned what we need to work on and are focusing on supporting the puck more and playing as a five-man unit rather than individually. This past weekend we went up to Rochester, New York, to play R.I.T. and won 6-2. We made a lot of progress since the first game (a 6-4 win against the University of New Brunswick, Canada). I've felt very comfortable in the games so far. My coaches and teammates have helped me a lot in practices to help prepare for the games. We are taking this week to get ready for Colorado College (on Friday) and UMass-Amherst (on Saturday). So far I've been paired with (New Jersey Devils prospect) Steven Santini. He's an amazing defense partner and has helped me with systems and getting used to the way B.C. plays. He brings a strong defensive force every time he plays, and makes it uneasy for forwards to play against him. We're starting to get very comfortable with each other on the ice. Coach (Jerry) York pushes me to play my game and jump in the play. He also tells me to keep the game simple and move the puck quickly. He encourages me to support the puck up the ice and to not get caught ahead of the play. He has had a ton of experience in coaching, so being able to listen to what he has to say every day is a privilege. I try to not focus on anything going on outside Boston College because all that is really important right now is how my team is doing. Jack (Eichel) is a great player and I expect him to have a great year, but how he is doing has no impact on me or how my team is progressing, so I don't think about that stuff. I am looking forward to playing Jack's team, Boston University (on Nov. 7 at Boston College). Playing BU for the first time will be a lot of fun. Obviously growing up in Boston, B.C. and B.U. are the two golden teams, so putting on the B.C. jersey and playing against BU will be a ton of fun. The rivalry between these two schools is so great and historic, so it will be a game that I'll never forget. Thanks for reading and check back next month.